Thanks to a cooperation with SatoshiLabs I will be giving away one Trezor One Hardware wallet. A hardware wallet is a device to protect your cryptocurrency from being stolen by hackers. Hardware wallets use a isolated environment for offline transaction signing. That way the privat key the most important part of any blockchain transaction never goes online and leaves no room for compromise. 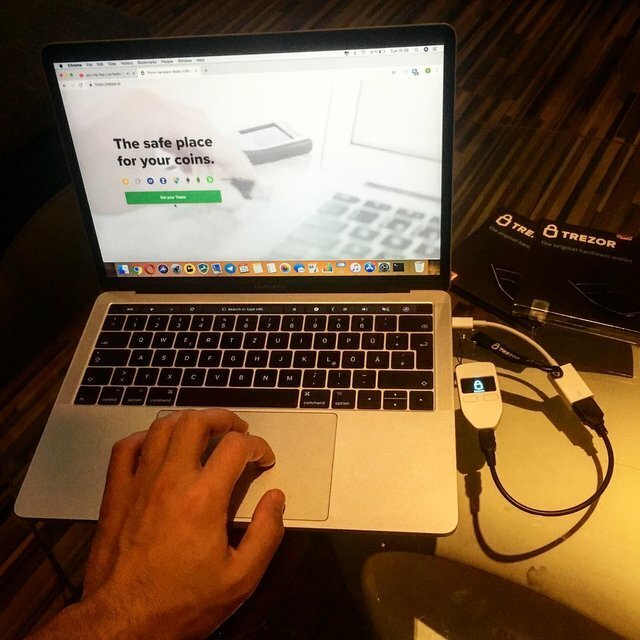 The Trezor wallet can be used safely even on a computer that has been infected with malware. Launched August 2014 by SatoshiLabs in the Czech Republic Trezor was the first Bitcoin Hardware Wallet on the Market. Today Trezor supports well over 500 cryptocurrencies including Nem, Etherum, Dash, Zcash and many more...https://trezor.io/coins/ also Steem is not supported yet this could change in future. Recently Trezor.io released the open Beta for the in-wallet exchange which allows you to swap between cryptocurrencies safely and with no risk. To not only secure your altcoins but also keep your personal data away from the bad guys the Trezor hard-wallet also comes with a integrated password manager which is used to create and store new passwords on a encrypted way. The Trezor One wallet is very easy to use so even my 14 year old brother set everything up without asking for any help this makes it perfect for new comers that want to have a good sleep now that all tokens are safe other than storing funds on exchanges where hacks occur frequently . Big thank you to SatoshiLabs for making this give away possible! “Threat is a mirror of security gaps. Cyber-threat is mainly the reflection of our weaknesses. nice offer, safest place for crypto is on a Trezor!!! Thank you sir @xemurai for sharing about the valuable information about Trezor Hardware Wallet. I think Trezor Hardware Wallet gives me an extra security to safe my crypto assets as for big crypto holders should use Trezor Hardware Wallet. I have a question that can we use it in our mobile? Ok sir, thank you so much for the valuable information. Trezor hardware wallet is the one that secure crytocurrency from being attack by hacker, i think if i can have it, it will help me secure all my cryptocurrency and it also used an offline transaction for signing so it will helps me in setting it up without internet. It will also help me to swap my crypto securely without any threat, i think if i can have it will secure all my cryptocurrency. i want to win just because i am mining ethereum by my gpu and and i always hearing hacking news about myetherwallet.com so thats why. i want secure my eth. You are worth more than my whole life, don't say that. My chance of winning is high coz I am positive about this contest. Thanks, @xemurai for encouraging this community., If steem have more user like you then no one can stop steem to the moon. @xemurai you are doing very good work on this platform. keep it up dear. And i want to win this because this is very useful thing to save our crypto. Can i get something else in return? I did not know about this. It can be a great solution to ensure my satoshis. I join the raffle! This is a very good information to every crypto handler, This is a great innovative i thing , tech never stop moving, imagine not even your computer get to know your password. privacy and securities is what matter most in crypto trading as it is modern trading system which alway prone to hack. If i could be giving the hard wallet maybe i'd be a successful large crypto investor as it's my dream to become one. Thanks @xemurai "information is power". You are doing awesome work on steemit. Really very nice. Secure, transfer, receive coins offline. Less prone to hackers because its offline. i can secure my digital asset because Trezor is the most trusted hardware wallet. Thumbs up @xemurai . With what you explained up there as per the distinctive feature of Trezor, I'd like to get the bonus as i intend to start to use Trezor to store my crypto asset (s). Been long i heard about it but i'm pretty convinced here. I have been looking at a secure way to hold my cryptocurrencies for ages, I am in Australia so the cost of these devices is highly inflated. Trezor hardware wallet Good idea, this change the experience of cypto trading as Users can store multiple cryptocurrency in a single secured wallet. i appreciate the security level . Good info, thanks for sharing,..
do not forget to do the same in my last publication! Wow very grateful post sir.i like it your beautiful life. You got a 17.99% upvote from @postpromoter courtesy of @xemurai! How is the winner to be chosen? Will it be the one with the best comment or just a random pick? I will love to have to have it sir, just to keep my coins safe from hackers.